General Motors has issued a bazaar recall and a stop sale order for the 2013 Buick Encore over a concern that the steering wheel may not have been fastened down properly - which could lead to the steering wheel coming loose of the steering column while being driven. This new 2013 Buick Encore steering wheel recall only applies to a small group of vehicles built between December 9, 2012 and December 28, 2012 so only 144 units are included in this recall. Of those vehicles, 59 have been sold to customers while the other 85 will be inspected by the dealerships which currently possess them. In addition to the recall, GM has issued a stop sale order of those 85 Encore small SUVs until the problem has been remedied. Fortunately, there have been no reported accidents or injuries stemming from the steering wheel separation risks of the 2013 Buick Encore. This troublesome steering wheel recall issue comes due to a shortage of parts at the GM Korea assembly plant in Bupyeong, South Korea. GM North America was made aware of a steering wheel separation concern on the Opel Mokka, which is essentially the exact same vehicle as the Buick Encore but the Mokka is sold in other markets. It turns out that a batch of SUVs (both Opel and Buick) were built with a non-heated steering wheel because the heated steering wheels were not available. After assembly was complete, those vehicles which were intended to have heated steering wheels were retrofitted with the proper heated wheel and it seems that during the retrofitting process – some of the steering wheels were not properly bolted onto the rest of the steering assembly. In these 144 examples of the 2013 Buick Encore, should the steering wheel have not been bolted on properly it could progressively loosen. Over time, if the wheel is not tightened the wheel could get loose enough that it could no longer accurately control the direction of the vehicle and in the worst case scenario – the steering wheel could come free of the column so the driver would have no directional control of the sporty little Encore. Needless to say, that poses a serious risk to the occupants of the Encore along with everyone around them so GM is acting fast to get these SUVs back into the dealership for the necessary repairs. 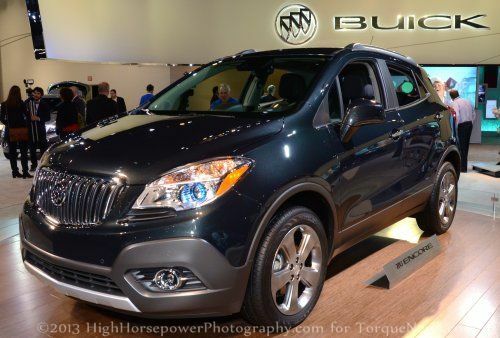 This recall is set to officially begin on April 12th, when those 59 2013 Buick Encore SUVs will be returned to dealerships where a certified GM technician will inspect the steering wheel to ensure that it is fastened down correctly. From the wording in the recall, this will just be a matter of making sure that the nuts and bolts are all tight so this should be a nice quick, in-and-out kind of repair. According to Edmunds, GM has already reached out to these 59 owners and their vehicles are scheduled for inspection and any necessary repairs. If you own a 2013 Buick Encore that was built between December 9th and 28th last year, you can contact General Motors at 1-800-521-7300 and inquire about recall campaign number 13098.